I find great inspiration through great reads… occasionally. One read that I’m continuing to work through is Searching for and Maintaining Peace by Father Jacques Philippe. My friend Mary gave me a copy as she is aware of the struggles in my life during this season. One of the struggles that I have is exactly how much space God needs to work. What I mean by this is how much abiding is necessary? What’s the line between His will for my life and my will for my life? If a prayer isn’t answered, is it because it just not time, or is the answer ‘no’? At what point does faith turn into insane hope for something that just isn’t going to be? When does my actions slide from being ‘in His will’ to ‘doing my own thing’? It is important to know one thing: We cannot experience this support from God unless we leave him the necessary space in which He can express Himself. I would like to make a comparison. 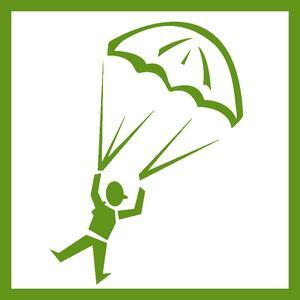 As long as a person who must jump with a parachute does not jump out into the void, he cannot feel that the cords of the parachute will support him, because the parachute has not yet had the chance to open. One must first jump and it is only later that one feels carried. Many do no believe in Providence because they’ve never experienced it, but they’ve never experienced it because they’ve never jumped into the void and taken the leap of faith. They never give it the possibility to intervene. They calculate everything, anticipate everything, they seek to resolve everything by counting on themselves, instead of counting on God. Yep. That about sums it up. I am a chronic calculator, anticipater, problem solver and quick to steer things in the direction that I want them to go. I still think that some of that is good. I believe that my natural abilities can be used by God… be instruments of Providence. However, I believe that at times… even right now… God is asking more of me than I can humanly accomplish. Right now, I think He is steering me, coaxing me, and urging me to buckle up my parachute because the plane is going to crash and I HAVE TO trust Him, jump and allow Him complete control. I feel like Joseph. You know, Jacob’s young boy in Genesis that was sold into slavery by his brothers… send to Egypt… spent time in prison. He probably would not have chosen that season of life for himself. He probably would like to have remained with his family in Canaan. He didn’t really know what God had in store for him… what the future held… how God was going to raise him up as a leader AND play such a huge part of HIS plan. That’s how I feel… confused and not really wanting to go, but trying to hold firm to the promises of God and the belief that God will never leave nor forsake me. Guess it’s time to jump! Be Blessed on this Resurrection Weekend! Need to encourage someone? Check out amazing Inspriational Gifts that share God’s love at www.ChristianGiftsPlace.com. Next New .925 Sterling Silver Jewelry Just In – Introductory Pricing in effect!